The Genroku Era in Japan was remarkable for its political stability, economic progress and cultural activity. The Tokugawa Shogunate in Edo was in its fifth generation of rule. The relationship with the Emperor in Kyoto was particularly good. In the fourteenth year of the Genroku Era (1701) the Lord of Ako, Asano Takuminokami, was ordered by the Shogun to take care of all details involved in the formal visit by a special envoy from the Emperor. It was a great honor for the Lord of Ako to be entrusted with this heavy responsibility and diplomatically delicate matter, particularly when he was still a young man. The Lord accepted the position with delight. Sadly it ended in tragedy for Ako. It was necessary to learn the intricacies of traditional protocol and etiquette. Kira Kozukenosuke, the Shogun's expert in this field, instructed Lord Ako. However, to the surprise of all observers Lord Kira lied to Ako, ignored his needs and was generally nasty. Lord Ako responded with patience. The explanation for Kira's behavior was in his greed. Kira felt that Ako had not given him gifts to show appreciation which were appropriate to Kira's status. On the day the Imperial envoy arrived Lord Kira was very rude to Lord Ako in one of the castle's corridors, Matsu no roka. Lord Ako struck back with his sword. Kira was only slightly injured. There was a strict regulation forbidding anyone to draw a sword in Edo Castle. The punishment was severe. The Lord would have to commit ritual suicide, his land and property would be seized, his family broken up, and his subjects would lose their means of making their living. These punishments served the long term political interests of the Shogunate. Lord Ako had clearly broken the rule. Kira's injury made this obvious. Ako was ordered to remain in the castle and to commit suicide the same day. There was a great deal of sympathy for Ako among the people who knew the extent and nature of Lord Kira's provocations. A sympathetic guard allowed Kataoka Gengoemon, one of Ako's retainers to enter the garden where the suicide would take place. The two men were not permitted to speak but the loyal retainer saw the sorrow Ako felt for his people in his eyes. On March fourteenth Asano Takuminokami, the Lord of Ako, died. When Ako's wife, Aguri, heard the news she calmly cut off her beautiful long hair symbolizing her withdrawal from the affairs of this world to devote her life to praying for the dead. The chief retainer, Oishi Kuranosuke, called a meeting of the clan to discuss their future. Even though the people did not unanimously support their late master, Oishi decided the clan would refuse to leave the castle and would fight the Shogun's forces to protest the unfairness of the judgment which left Kira completely unpunished. Some people refused to stay. Ten days later Oishi changed his plan. He announced that everyone was to leave the castle and beg the Shogun to punish Kira and to install Ako's younger brother as Lord. More people disagreed and they left. The people who left the clan were mainly people who hadn't seen what Lord Ako had to endure in Edo at the hands of Kira. Finally only about fifty people were in the castle, some of them were only about fifteen years old. Oishi wanted the youngest ones to leave but they were determined to stay. Oishi told this small band his true intentions. He wanted them to obey the Shogun's orders but later to go secretly to Edo, to watch Kira and finally to seek revenge for their master. They had to succeed the first time a second try would be impossible. Oishi emphasized that no one should suspect what the plan was. This was why he changed his plan several times until only a trustworthy band remained. The band of fifty left the castle. The transition went smoothly. The new lord was a son of Kira's, the head of the Uesugi family. The chief retainer of the Uesugi family, Irobe Matashiro, knew Oishi's plan. If the Uesugi family got involved they would be in danger of losing everything if the Shogun punished them. Irobe secretly sent two of his people, a young girl Oran, and Kobayashi Heihachiro to kill Oishi and stop the plans for revenge. Oishi had been hiding his true intentions by living a drunken, debauched life. His divorce from his wife appeared to be because of his disgusting behavior but in fact he wanted to protect her from punishment after the revenge was carried out. The Ako soldiers in Edo were suffering from poverty and stress as they tried to watch Kira, make their living in unfamiliar ways and keep the plan secret from even their own families. Some sold their wives, joined other clans, and even took their own lives in the desperation brought on by the frustration of waiting. Oishi finally received an answer from the Shogun. The younger brother of his master would not be allowed to head the family in Ako. Oishi took the first steps to put his plan in action. He had to find out how to get a plan of Kira's house and how to find out when he was at home. At that time the people of Edo were so often complaining about the government they would have welcomed the Ako revenge. This made Irobe even more anxious about how to keep the Uesugi family from getting involved. Irobe's agents, Oran and Kobayashi, failed in an attempt to assassinate Oishi. Oran admired Oishi's bravery. One of the Ako soldiers, Okano Kinemon, had disguised himself as Sakichi, a grocery shopkeeper. He befriended Okiku, the daughter of the carpenter in charge of renovations made at Lord Kira's home. He tricked Okiku into getting a plan of the house for him. However, Okiku and her father in fact knew who Sakichi really was and wanted to help him. It was discovered that a tea ceremony with Lord Kira in attendance was going to be held at the end of the year. The long wait for revenge would come to an end that night. But somehow Irobe learned of the plan and was able to keep Kira out of the way. Irobe had hoped the men of Ako would go ahead with their plan and be captured by the Shogun's soldiers. However, Oran warned Oishi. Kobayashi learned Oran was a traitor and killed her. Later another tea ceremony was planned at the Kira home for December fourteenth. The loyal followers looked forward to getting revenge on the same day of the month Lord Ako died, exactly one year and nine months before. Late at night forty seven Ako soldiers attacked the sleeping household, found the fleeing Lord Kira, and at long last satisfied the honor of their master and justified the hardships of the long wait by slaying Lord Kira. In the falling snow the forty seven men of Ako marched calmly toward their master's tomb. They welcomed the next meeting with their Lord that their own deaths would soon bring. Final performance for top star Mori Keaki, as well as Wakou Hajime, Yuubi Kagari, Shirasagi Madoka. 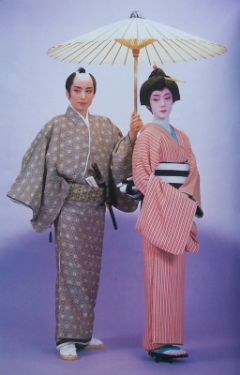 Nozoe Sayuki retired after the Takarazuka run. Itsumine Aki, Yuumi Reo, Takaragi Aya, Kaede Saki and Arisa Miho were absent from the Takarazuka run which coinceded with the New York tour. They returned fot the Tokyo run of the Chuushingura. Mayuzuki Kou, Yumeki Noa, Takashiro Kei, Asada Kou, Hibiki Maria, Yuuna Aki, Hanabuki Mai, Akasaka Miki and Yuuki Mao joined the cast on 93/1/9, after the 78th class assignment. Created by jenebi. Last Modification: Tuesday 07 of August, 2018 18:26:26 PDT by caithion.